Lex Luthor enjoys new fame and celebrity as his TV news station covers the parade honoring him for saving the Daily Planet and its occupants from the clutches of Brainiac. Jimmy Olsen watches in disgust from the monitors at in the Planet Newsroom while Perry White chides him for not paying attention to the fact that Lex owns that station and they'll say what he tells them to. Lois and Clark stand in the corner of the office and Clark says that even though Lex may have been partially responsible, that at least he returned Lois to him safely. But Lois notices the mark on his neck from the exobyte that bit him at the end of the last issue. They go to the rooftop and Clark explains that the attack on Supergirl was just a test and that there must be something more to Brainiac's plan than simply stealing powers and abilities from Earth's metahumans. Clark gets a call from the JLA and has to fly off as Superman for a meeting. But moments after he leaves, Lois exhibits electrical powers that she can't control and hopes that once Clark doesn't have so much on his mind that she can confide in him about it. Superman arrives outside Bruce Wayne's mansion and listens into the conversation between the JLA members about how Superman abandoned them in the middle of a battle to go save the Daily Planet and that he can no longer be relied upon. At the home of Perry and Alice White, Perry returns from work and washes up until Alice screams about a grease fire on her stove. Perry bolts to the kitchen and shoots ice out of his hands that stop the blaze. Neither of them can understand what just happened. Jimmy Olsen plays video games at his apartment and yells at the bad guys he's fighting on the screen, but then transforms into a large turtle boy. Daily Planet cafeteria worker Marge Williams comes home to her ungrateful husband who expects his dinner. When she tells him he should have made himself a sandwich, he pushes her, but she turns around and pushes him back... through several walls. Now drunk with power, Marge is happy with his death. In the Batcave, Superman enters and apologizes to Martian Manhunter, although he appeared to have been targeted in the battle with the exobytes and may well have lost all his abilities even if Superman hadn't flown off to save Lois and the Daily Planet. Even though Batman continues to claim that Lois was in no immediate danger, he forgives Superman, at least for now. But then an alert comes from Metropolis. The Toyman and the Prankster are taking advantage of the chaos in the city and attacking from floating platforms, so Superman flies off again to go help. During the fight, Brainiac manages to use the exobyte infection in Superman's system to stop his flight powers, leaving him unable to escape Toyman and Prankster's weapons. Brainiac mentions that Superman's Kryptonian biology is still resisting the exobyte and he can only weaken him, rather than remove all his powers at once. His powers return and Superman redoubles his efforts, but Toyman and Prankster's floating platforms suddenly explode, killing them both. On the ground, Luthor grandstands and claims that Superman should have saved them. Superman tries to explain that his powers weren't working properly, but Luthor uses the situation to turn public opinion against the Man of Steel. Story - 3: I've already talked about this, but it was brought up again. 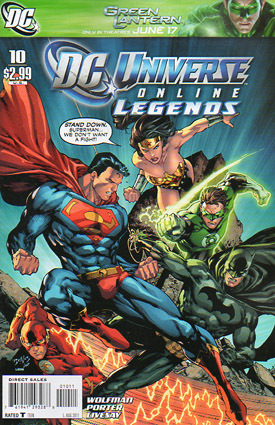 Batman blamed Superman for leaving the fight last issue to save Lois and the bottled up Daily Planet, claiming that they were in no immediate danger while it was on Brainiac's ship. But it wasn't on Brainiac's ship. Lex Luthor had taken it back to Earth and contacted Superman exclaiming that he had the bottle in hand and was being chased by Brainiac's robots. So Batman's claim that staying with the team to fight instead of flying off to save Lex, Lois and the entire Daily Planet was more important, is not only false, but if it's the reason he thinks Superman is out of control, he's an idiot. And I refuse to think of Batman as an idiot. This story has heated up and cooled down several time already and this was a great way to handle a "cooling down" chapter that still advanced the story in new and interesting ways. If the whole comic is separated into 3 story arcs, this seems to be the start of the third. I look forward to where it's going next, but I also hope to find out more about Lex from the future soon. Art - 4: I freely admit this style of art is not my cup of tea, but there's no denying it's executed well here. It's purely aesthetic, so I can't fault the style. Frankly, the colors do a lot to draw the reader into each page. Cover Art - 4: I'm a sucker for covers with word balloons. I didn't always care for them, but in my collecting adulthood, I've grown to appreciate them more and more. But as with the interior, the colors stand out and I'm glad these characters were used. Plus since we still have those obnoxious Green Lantern movie banners at the top, at least there's some green in the rest of the cover to balance it out.